Clay is plastic, adhesive material that can form any shape. It is often used as an educational toy for children to make their creativity higher. However, many people cannot make things as they want with clay because they haven’t brushed up on their technical modeling skills and don’t have any chance to do it. In this paper, we propose a system “ClayMore” to support acts of modeling clay. 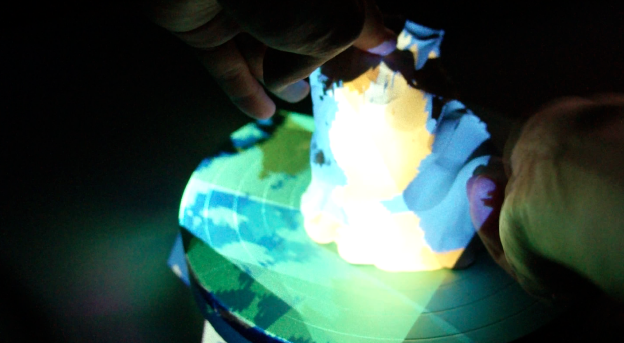 In this system, the shape of clay is monitored by a depth sensor and system-generated images or movies are shown on the skin by laser projectors, to make clay into I/O device. I also described one of the applications using ClayMore, supporting acts of imitation with clay. This application shows the difference between the shape of the clay and one of the target. 若園 祐作，暦本純一：ClayMore: 粘土を用いた造形の支援，インタラクション2013 インタラクティブ発表，(2013. 3)[new! ].